Quemadmodum desiderat cervus (‘Like as the hart desireth’), set for solo bass and a small string group, stylistically belongs to an early period. 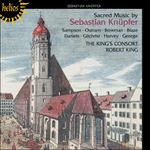 It probably originates from the beginning of Knüpfer’s career in Leipzig; it perhaps belongs to a collection of sacred music which was to be printed in 1663, but apparently was eventually not published. The Italian influence, notably that of Giacomo Carissimi, is evident, especially in the flowing theme of the concluding triple-time movement. vita mea, o bone Jesu, o dulcis. o bone Jesu, o mi Jesu. my life, O good Jesus, O sweet. O good Jesus, O my Jesus.